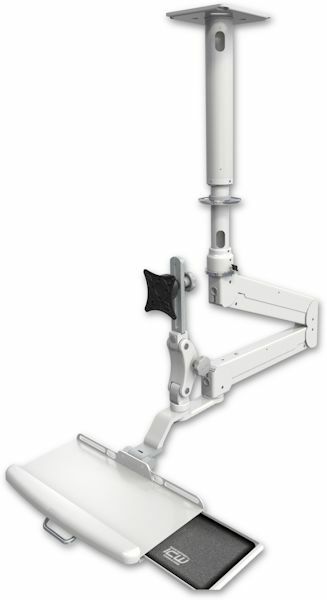 Securely rotate, tilt and swivel your overhead mount in or out of the way. ICW’s ELP 6220 Double Elite Ceiling Mount adjusts to fit the depth of your drop ceiling. Entirely cable managed, its articulating arm has exceptional range of motion so you can adjust your ceiling mount to any viewing angle. It’s an excellent solution for healthcare, dental and industrial applications. ONE-OF-A-KIND DESIGN with sleek and sturdy construction. Engineered for years of reliable service. IDEAL for ceiling mounts with a keyboard. MOUNT stows convieniently overhead and rests 12″ from the base of the drop pole. FULLY CONCEALED internal cable management protects cabling. STOP PIN prevents mount from turning 180º and twisting cables internally. SLIDING MOUSE TRAY can be pulled out to left or right side. ADJUSTABLE DROP POLE has two options 19″ to 26″ (48.3 to 66 cm) and 26″ to 37″ (66 to 94 cm). STOWS SAFELY out of the way, overhead above the user. *Available in your choice of 5 standard and 9 custom colors. Call for information.